As I write this, I am in Strasbourg, France, sitting in a nice outdoor café by the canal, and drinking a pastis. This is a very civilized way to collect ones thoughts after a busy show! When I told John that I would do a show report, I had no idea what it really involved. Now that I have an inkling of such, I will both commend John on the fine thorough job he always does, and apologize for what you will find to be an abbreviated report. This year, prior to going to the show in France, I flew over early to visit friends and go to the show in Freiberg, Germany. 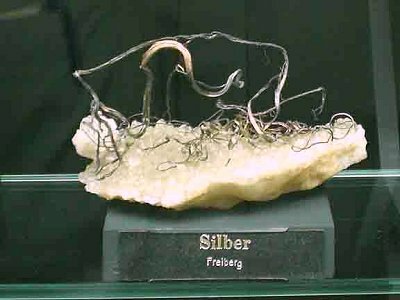 I had wanted to go to Freiberg for years in order to visit the famous mineral museum. 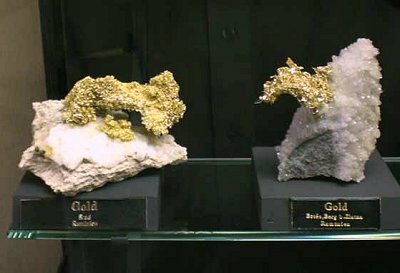 I have been fascinated with the minerals and mines of Saxony ever since I learned about them in an economic geology class in college. I should have not waited so long to see the museum’s mineral collection! It is fabulous! I highly recommend making the effort to go there! 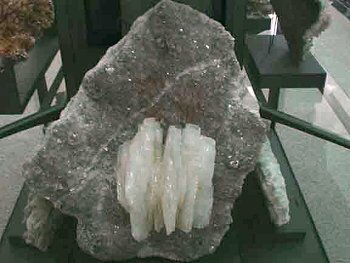 In fact you may want to make a special trip as the museum has been endowed with a gift of what must be one of the finest and most extensive mineral collections in the world, that of Dr. Erica Pohl. An entire building is being renovated to house both this new acquisition and the old museum collection. I believe opening of the new building is slated for the end of next year. Given the monumental task of assimilating such a large collection, I will be duly impressed if things stay on schedule! Regarding the present collection, I had assumed that it would be only classic pieces from Saxony and surrounding areas. In reality, the collection is quite diverse, and has in addition to the classics, an extensive contemporary worldwide mineral suite. I had certainly expected to see many fine silvers and was not disappointed. What really surprised me though, was the variety and quality of the fluorites and barites from the region. There must have been fantastic pockets in many of the mines of the Erzgebirge! Here are a few photos of some exceptional pieces (sorry about the photo quality as they were obviously shot through glass with no flash). The following are photos of something that really got my attention. I have seen many Romanian golds, but these were really superb! And this barite on fluorite is close to a meter tall! In case you make it to Freiberg, there are some nice little places to stay, and the restaurant I ate in was quite good. It featured Bohemian dishes, which were excellent. For those of you in the States, I recommend trying a real Budweiser beer. You will then know what you have been missing all these years! 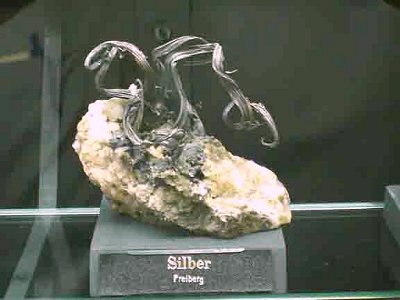 The mineral show in Freiberg is a great little show. It is only a 1 day show with perhaps 60 or so dealers. 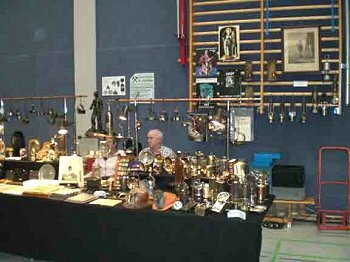 Many of the dealers are local collectors or part time dealers with primarily local inventory. 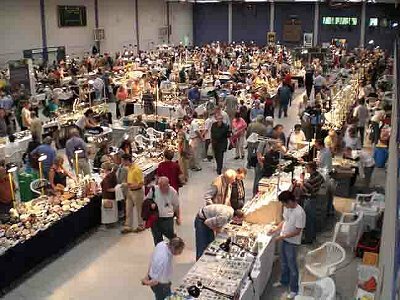 There are in addition many dealers selling “tourist” rocks and then a handful of the bigger dealers that one sees at the major shows in Europe and America. A surprise to me was the presence of a few International dealers from China and Pakistan. 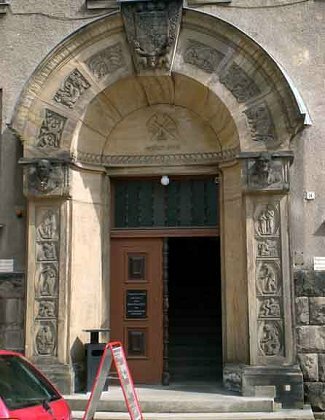 I understand that it is relatively easier to secure travel visas from Germany than it is from France, so a few folks come to the show in Freiberg prior to going down to Ste-Marie. The show was a perfect size to see pretty much everything in the one day, and still have time to visit the museum. As testament to the show, I managed to spend quite a bit more money than I had expected! As an example, I purchased the entire lot of annabergites a local collector had found on a trip down to Laurion, Greece. This year’s show at Saint-Marie-aux-Mines was a bit different than previous years. The how has been expanded drastically! It now has nearly as many dealers as Munich. There were many new tents, plus a couple of new outdoor isles lined with tables as well as two new large exhibition halls. It almost feels like it has doubled in size! Even with all the new dealers, and many, many collectors, the show ran smoothly. Michel Schwab and all of his helpers should be commended on the fine job they did in running the show. Parking was even easier than I remember in past years. All in all it was a great show this year. For overall color and visual impact, the most significant thing at the show was the liddicoatites from Viet Nam. Frederic Escaut and Dan Weinrich had a small lot of tourmalines that have absolutely fantastic color and luster. While not exactly new, the quality of these specimens is so much better than any seen in the past, and is truly noteworthy. This lot sets the standard by which other pieces can be compared. As to the price, well, suffice it to say they were not inexpensive. Liddicoatites from Viet Nam. The largest is about 10 cm in height. From Peru we have new augelites that are as good or better than anywhere else in the world. It is impossible to guess what will happen in the future with this mine, but I see great potential for world-class specimens. 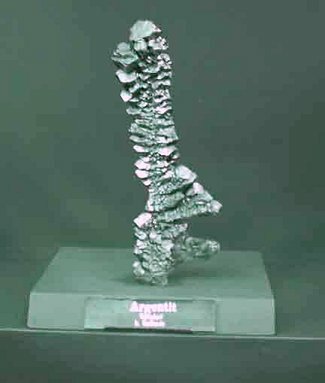 The augelites were brought to the show by Manual Ortega. 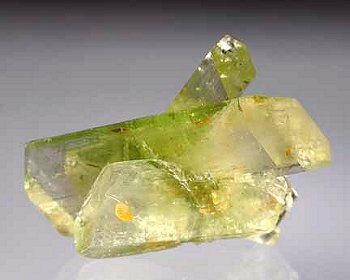 Manual and his brothers were mining quartz to be used as bases for their bird carvings, and lucked into a green mineral that they thought was fluorite. Visual inspection as well as analyses in Milan and the museum in Vienna proved these to be augelites. 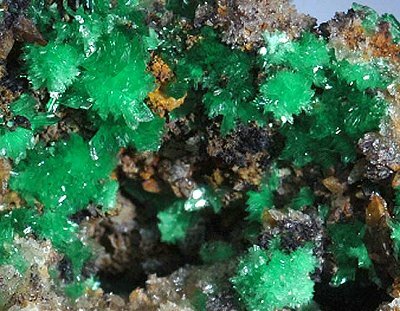 They are gemmy green crystals, often doubly terminated on a matrix of clear-white quartz (keep an eye out for Japan Law Twins with the augelites too). Initial production yielded many damaged crystals, but potential is there for good crystals to 4cm! 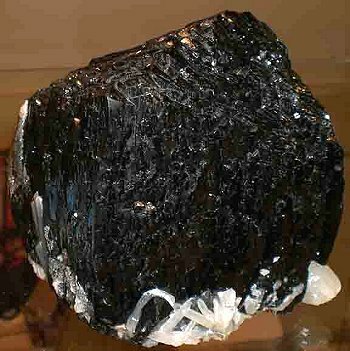 The specimens come from an old mine North of Huanzalá in Ancash Department. The Ortegas are calling it Mina Ortega. I will do some research to see if we can find out the original mine name too. 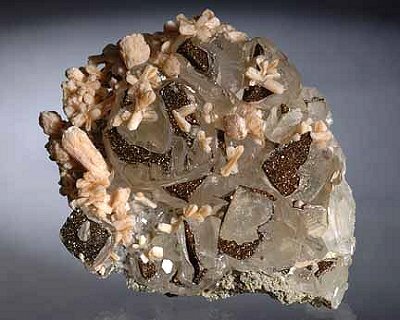 This specimen of augelitehas doubly terminated crystals and is about 2.5 cm across. 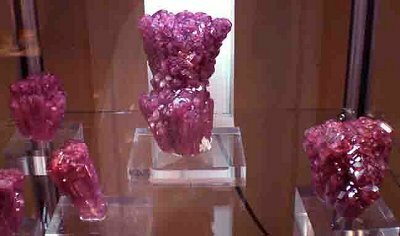 From China there were as expected a huge number of specimens to look at, but mostly normal things or minor variations on known minerals and localities. 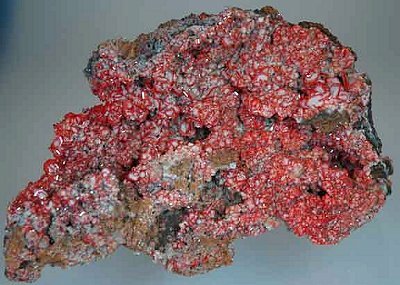 There was however, one exciting new find of red wulfenites from the Mian Ning mine, Sichuan, China. 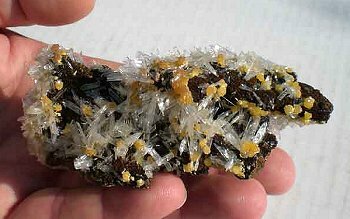 A few scattered pieces of wulfenite have been brought to previous shows, but always with tiny crystals. 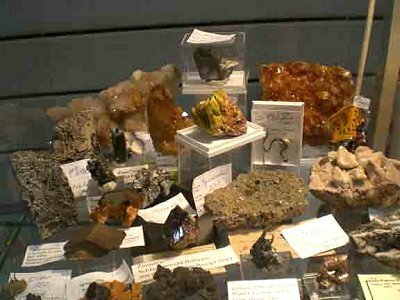 Rene Daulon brought one small lot of very high quality wulfenite to the show. 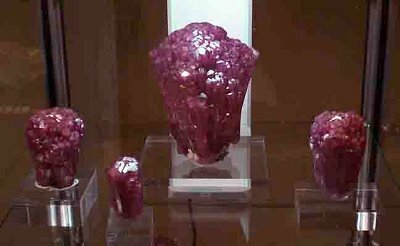 The crystals are up to 1 cm., and have very good color and luster. I was fortunate enough to buy the entire box of about 10 good specimens. Two of the typical specimens of wulfenite that I picked up at the show. 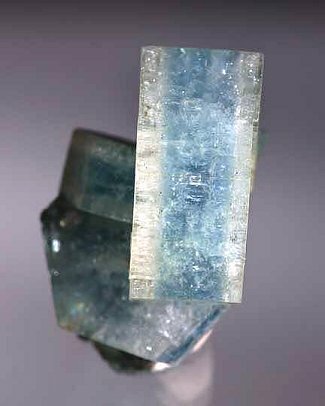 While aquamarine is not new to the Erongo Mountains in Namibia, a new find was made of tabular crystals that are really interesting. Most were thumbnail specimens with crystals to 2cm in diameter, and usually less than 1cm thick (along the C-axis). Symmetric zoning along the C-axis makes for aesthetically pleasing specimens. Tabular beryls from the Erongo Mountains in Nambia. Laurent Thomas brought new hematites on rutile and some nice red cap tourmalines from Madagascar. 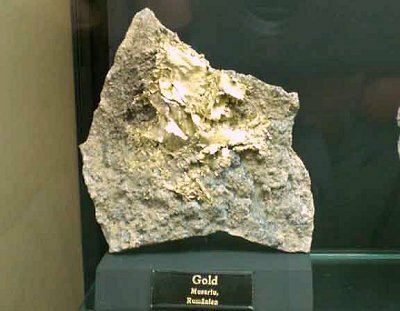 From Kazakhstan, some new calcites came out of the Rudny deposit. 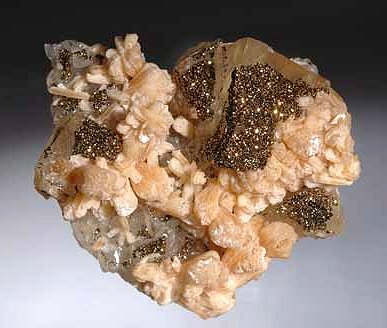 These are highly modified rhombs with selective pyrite coating, and associated stilbite crystals. Only 9 pieces were available at the show. Two of the typical specimens I picked up at the show of calcite with pyrite from Kazakhstan. From Pakistan, Francois Lietard had some fluorite and topaz specimens (I’ve not seen the association before) from Shingus, as well as nice epidotes with quartz from Kharan Mtn., Baluchistan, Pakistan. These look very similar (but better quality) to the epidotes from Peru. Several of the Pakistani dealers had a bit of the epidote material, but Francois appears to have secured the best pieces. 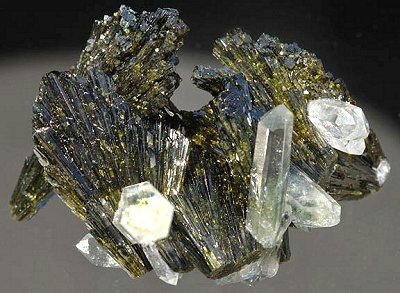 One of the quartz and epidote combination pieces from Pakistan. From Mina Ojuela, Mexico, there are some new mimetites with hemimorphite that are quite attractive. Matthias Jurguit brought these back with him from his last trip to Mexico, and then Jurgen Tron managed to high grade the best pieces. 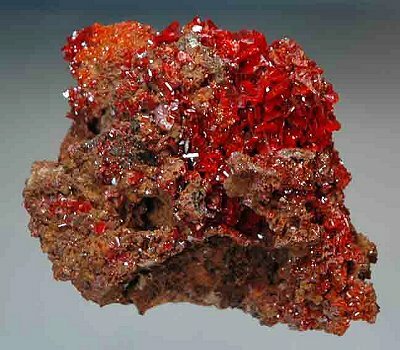 Jordi Fabre had some very pretty red varisite (ferroan?) from Brazil. He indicated that he would be doing additional analyses on this material. 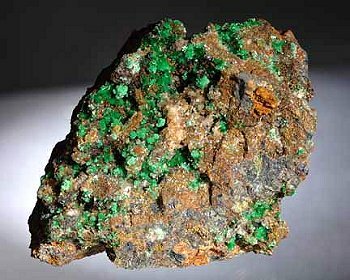 While not new, I must mention that Jordi had the most impressive ilvaite I have ever seen from South Mountain, Idaho.d I have collected at the site numerous times, and have never heard of any pieces that even come close to the size and quality of this piece! From the Congo, Alain Martaud had a small lot of very good quality malachite “roses”. It seems that so much of the copper, specimens included, from the Congo is going straight to China to become metal pipe and wire, that very few specimens are making it to the market. It is a good thing that someone made the effort to save these, as the quality is exceptional. Now that most of the fluorite mines in France are closed, it looks like old collections from miners are starting to show up. I have never seen such quantity and variety of French fluorite at any show. The Chinese certainly have not cornered the fluorite market, especially when it comes to blue and yellow fluorite! All in all, the Sainte-Marie-aux-Mines is one of my favorite shows of the year! 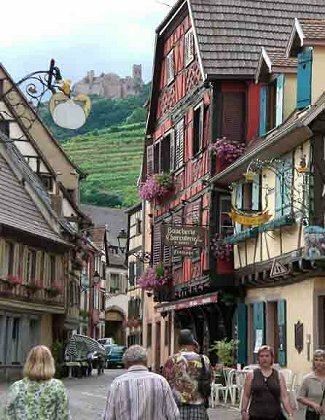 I enjoy the open-air venue, and Alsace is a great place to visit. It’s hard to beat getting to look at minerals all day and then eat great food and enjoy a bottle or two of wine with friends all under the auspices of “work”. The dollar may be very weak against the Euro, but there are still opportunities for anyone willing to look around a bit. For those not constrained by exchange rates, well, good on you! Ribeauville (my favorite place to eat and walk around). 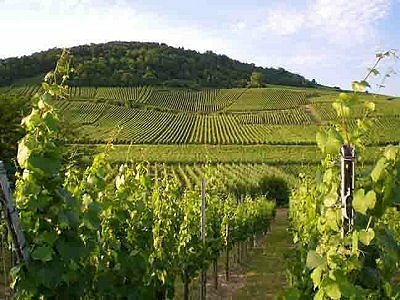 Vineyards in the immediate area. I think I should say "thanks" to John for "letting" me write a report on the Sainte Marie show. Over all it was a good show with many interesting things to see. It has grown tremendously over the years and is now one of the major global mineral events of the year. You can expect to see specimens featured in this report on my website in the coming weeks.